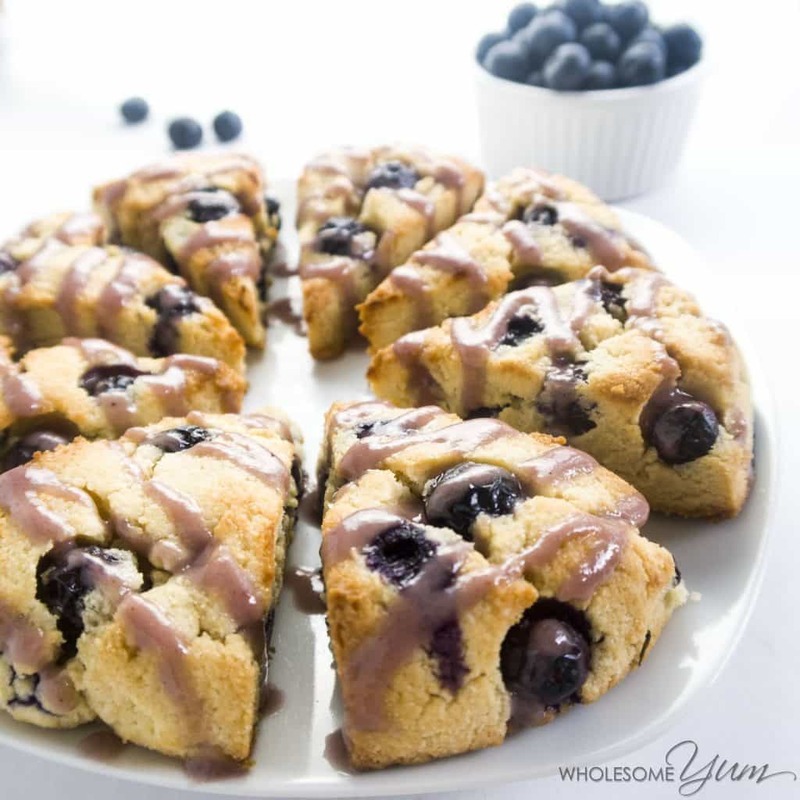 These paleo, low carb scones are bursting with juicy fresh blueberries & topped with natural blueberry glaze. 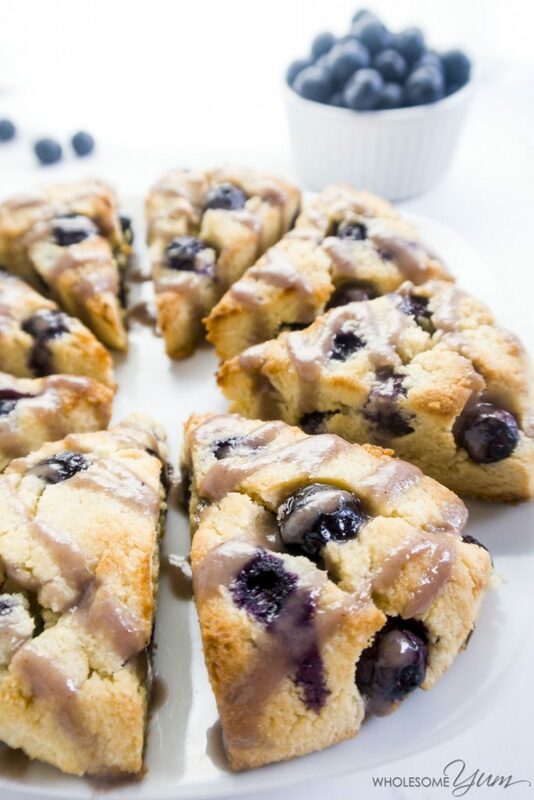 You'll love this easy blueberry scones recipe! When I first started baking, one aspect of the process that was always fascinating to me was how the same combination of ingredients could result in completely different products, depending on what you do with them. For example, you can use the same ingredients to make muffins, scones, pancakes, cookies, biscotti, or even a cake! It’s just a matter of ratios, oven temperature, and how you shape the batter or dough. These easy blueberry scones are the epitome of that. It’s my favorite paleo low carb scones recipe! Being a scientist at heart, I love to experiment and figure out how things work, so it’s truly rewarding for me to see how changing different variables transforms the end result. Even given the same ingredients, you can make the mixture dense or runny, thick or thin, enclosed or out in the open, split into small portions or one large one, and so on. That doesn’t even begin to cover the possibilities that emerge when you begin swapping ingredients. Prior to my clean eating days, I always loved blueberry scones from coffee shops. Curling up with a hot latte, a crumbly scone, and a good book my laptop (who am I kidding?) was the perfect way to spend a morning off. Or an afternoon or evening. Give me coffee and scones any time of day, really. I had assumed that an easy blueberry scones recipe would be difficult to make and guaranteed to be unhealthy. How could something so delicious be any other way? It turns out, I was wrong about both.Making low carb scones is actually very similar to make muffins, but the batter/dough is a little thicker, and instead of pouring it into muffin cups, you just shape it into a disk and cut into wedges prior to baking. Making paleo low carb scones is actually very similar to make muffins, but the batter/dough is a little thicker. Also, instead of pouring it into muffin cups, you just shape it into a disk and cut into wedges prior to baking. And you get easy blueberry scones! Blueberry scones have always been my favorite. The best part is the fresh blueberries that have burst ever so slightly. I’m actually so excited about blueberry season that my paleo low carb scones are double blueberry scones. They are packed with juicy blueberries inside and have a blueberry glaze on top! You can omit the glaze if you want to make these even faster. Personally, I highly recommend including it. 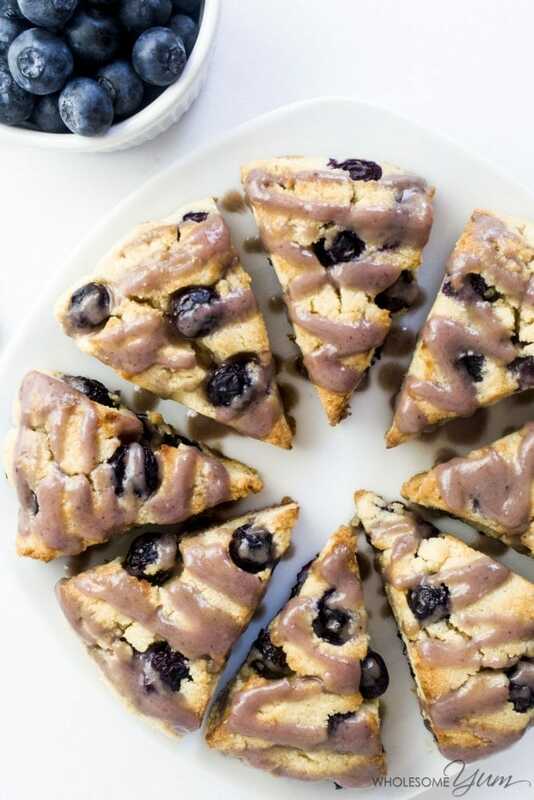 The blueberry glaze really makes these sugar-free scones extra special. If you’re looking to make keto scones around the fall season, try low carb pumpkin scones from All Day I Dream About Food. This sugar-free low carb scones recipe is a great staple to make over the weekend and enjoy for breakfast throughout the week. They taste like a treat, but unlike traditional scones, they are packed with protein, fiber, and healthy fats. That means they’ll keep you full for a while, without the blood sugar spike. Who needs the carbs, anyway? In a small bowl, whisk together coconut oil, almond milk, vanilla extract, and egg. Fold the wet mixture into the dry until a dough forms. (The dough should be pliable but not crumbly or stiff; add a little more almond milk, a teaspoon at a time, if it's dry.) Fold the blueberries into the dough. Click or tap on the image below to play the video. It's the easiest way to learn how to make Bluebery Low Carb Scones! Made the scones today only used 1 cup choc chips since that is what I had in the house instead of blueberries, awesome! Can’t wait to try blueberries! These scones were surprisingly easy to make and quite delicious!! I love them!! These were really delicious! Thank you for the recipe and the time and effort you put into this. For my glaze, the frozen blueberries that I used solidified the coconut oil in my blender. That was an experience! Lol. I only wish I’d seen the comment from the lady that put lemon in hers. I’ll have to try that next time. Super great recipe!! Does the baking powder have to be aluminum free? Hi Jan, It doesn’t have to be but I only use aluminum-free. These were actually very good! 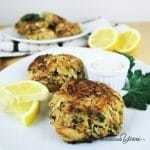 Wow – I made these for a group of friends and everyone was so impressed with the taste – 5 stars for sure! This recipe looks delicious. Any way to add protein power to these? Hi Amber, I’m sure you can but I haven’t experimented with that to give specific measurements. Can I use frozen blueberries or raspberries? Hi Mel, Yes, you can. Do not thaw them – just use frozen. I have a friend who is allergic to almonds. Is there a way to make these with only coconut flour? Hi Lillian, No, sorry, they won’t work with just coconut flour. Can your friend have other nuts? If so, a nut meal from different nuts is a better option. Or sunflower seed meal. This is such an amazing recipe! Thank you so much! Scones are a staple in our house (I’m in Ireland), so I’ve really missed them since starting keto in August last year. I’ve made this recipe twice now, first time with blueberries and last night with raspberries. (I didnt do the glaze, but they are still amazing without the glaze). Both options taste fantastic. This recipe is SO quick and easy, I’m definitely going to make these regularly! Awesome.. making 2nd batch..doubling to freezer. Cashew butter is yummy with them. I love scones and these were very good. I cannot have eggs but I sub with flax egg and I am happy with that. Just bake a little longer. 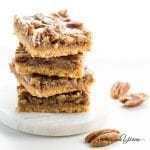 I made these tonight using hazelnut flour in place of almond flour because I was running low and used maple extract and pecans as my add-ins. Other than being slightly grainy d/t the flour these were perfect! This is an awesome base recipe and I will be trying other variations soon. Thanks for sharing!! I noticed in one of the comments that if you use frozen berries you should NOT defrost them first. Oops. Perhaps that was my mistake? Hi Jonas, Yes, that was definitely it then! Defrosting the berries first would make them very wet and they’ll make the end result too wet. Next time try with either fresh blueberries or frozen blueberries without thawing. Love this recipe! I have made these with blueberries, strawberries and mixed berries always tasty. I have even cut out the stevia and they taste GREAT! We love your pancakes too!! I am happy you liked the scones, Andrea! Thanks for stopping by! Hi Maureen, The quantity of sweetener is based on the sweetener used in the recipe, which is erythritol. You would need way, way less if you use stevia, and it depends on the brand (how concentrated, does it have a filler, etc). Check my sweetener guide for conversions – there is also a calculator coming soon to that page so you’ll be able to convert by grams. If I wanted to use frozen blueberries, should I defrost them or put them in the batter frozen? Thanks! Don’t defrost them. Put them in the batter frozen. I made these yesterday for a few friends. We all loved them. I did not have plain erythritol so I used THM gentle sweet. They turned out great. My glaze did not stretch as far as yours. I barely got a few smears on each. I will double the glaze next time. Ty so much, I love scones! I am so happy that you liked the scones, Lynnita! Please come back again soon! What are nutrition facts here? How many carbs and how much sugar? I also had trouble with the glaze. I just added a little almond milk. But don’t use frozen blueberries in the glaze. The coconut oil solidified. But these are really good! Hi Anne, The nutrition info is on the recipe card above. Love this recipe I have made it 4 times already and haven’t used the glaze as I think it is sweet enough! I am so happy that you liked the scones, Elisha! Have a great day! Going to give these a try…was wondering if the glaze was a big part of the taste or can I not glaze the scones. I’m not big on any kind of glazes or frostings. Will the scones on their own, hold a good flavor? Hi Julie, They are good without the glaze, too. Feel free to skip it. Made this with fresh peaches – YUM. Thanks for the recipe! I love that you added peaches, Jaymey! Thank you! I am so happy you liked them, Nelly! Hello! I love butter and I was wondering if there was a way to sub the coconut oil? In traditional scones, I believe the butter is added in cold chunks? Would I melt the butter for this recipe?? Thank you! Yes, you can use butter instead of coconut oil. For this one, you can just melt it. Delicious scones! Simple ingredients. I used raw cane sugar and it came out just fine. This is definitely going to be a go to recipe of mine. I love to hear that, Christie! Please come back again soon! Had anyone tried making with flax or chia egg? I don’t tolerate eggs. Thanks. Hi Josie, I’m sorry, I haven’t tried that. Please let me know how it goes if you do! This is the first time I have ever left feedback for a recipe. 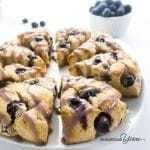 Your blueberry scone recipe was the best tasting, most satisfying, joyful experience while cooking and eating that I have ever had!!! It’s basically the first pastry I’ve eaten in months. It turned out so delicious that I really had to use my portion-control mindset to not eat two! My husband and children loved them, too (and they are not friendly to my low carb recipes). My scones looked like yours, they are bursting with freshness and buttery goodness, and I can’t wait to have my treat at 9 am tomorrow! THANK YOU very much. You’re an awesome cook! I also tried your doughnuts which were amazing, too. I bookmarked your site on my web bar and am trying your lasagna stuffed peppers today. Thank you so much, Cindy! Your comment truly made my day. I hope you’ll like the other recipes as much as this one! Looks yummy! Can’t wait to give it a try. I really hope you like it, Celene! Thank you for the recipe! I tried making it and I have a question: does it really call for 3 tablespoons of erythritol? Or teaspoons? It’s 4 g carbs per teaspoon. Our son is on a low carb diet, so that does make a difference. I added teaspoons and it was sweet enough. My scones turned out rather gray. must depend on the brand of the almond flour. Hi Polina, Yes, it’s 3 tablespoons of erythritol but you can use less if you want them less sweet. Erythritol can usually be omitted from carb count because our bodies don’t metabolize it. I have personally tested using a blood monitor and it does not affect blood sugar. Was wondering if I could just use almond flour instead of almond flour and coconut flour? Hi Katie, Sorry, no. The recipe would need other modifications to do that, and I haven’t tested to say specifically what would need to change. I subbed 1/2 c of flaxseed meal for the coconut flour and they were perfect. Good to know – thanks, Jennifer! Thank you for this delightful recipe. I used fresh squeezed orange juice instead of almond milk and dried cranberries instead of blueberries. I also used coconut sugar instead of Xylitol. My scones came out perfect and taste yummy. I am so happy you liked the scones, Robin! I followed this recipe with the only changes I made being strawberries for the blueberries and coconut sugar for the sugar. They are very good. When shaping mine to the same thickness and size as the picture, I only was able to get 4 scones, which doubles the calories per serving, and it took about 15-20 minutes longer to cook through. Overall really happy with the recipe. Thank you! Hi Nicolette, If you just cut it into 8 pieces like a pie, you’ll always end up with 8 scones. If they took longer to cook through, most likely they were thicker than mine. I’m glad you still liked the recipe! I am so happy you love the scones, Kimberlee! Have a great day! I used frozen blueberries and my scones were very moist..
Hi Kim, Did you thaw the blueberries first? If you do that they will be too moist – better to just use them frozen. Other than that, it may be that the scones needed to bake for longer. Hope you still liked them! Yes they were starting to thaw. I did bake them longer but they were still very moist and crumbled. I let him sit and they hardened up a bit. But still very delicious. I will try them again. I made these just as written. They were perfect. I served them at my Royal Wedding viewing party! I also posted a picture of my results on my Pinterest with the URL to your site. Thanks a million! I am so happy you liked the scones, Grace! That party sounds so fun! Made these to watch the Royal Wedding (Megan and Harry!!!) Turned out beautifully. No problem with being too dry. I ate three pieces and my husband ate the rest – not knowing they were made out of nut flours! What a perfect way to watch the Royal Wedding, Sharon! I am so happy you liked them! Do you think I could mix up this dough tonight, then bake in the morning? Looks perfect for watching the Royal Wedding tomorrow! Hi Amy, Baking powder reacts once mixed with wet ingredients, so I wouldn’t recommend making the dough the night before. But, you can mix the dry and wet ingredients separately the night before, and just fold them together and bake in the morning. Can I sub some other oil for the coconut? 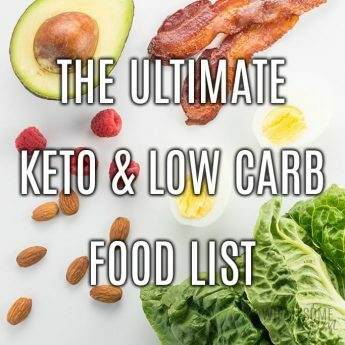 I’m low carb for a health issue and I’m supposed to avoid coconut oil. Thanks. Hi Caryl, You can use butter instead of coconut oil if you’d like. Coconut oil is totally low carb though, is there some other reason you need to avoid coconut oil? These taste amazing! I think I may not have had the dough moist enough though. They were very dense and didn’t seem to rise like your pictures that you have posted. Do I just need to add extra almond milk next time? Hi Andrea, I’m glad you liked the taste. The scones do not rise much, they just need to be shaped to be fairly tall. You can try a little extra milk but scones are usually dense and not fluffy… more milk would probably make them more similar to muffins. I’m new to Keto and still don’t like almond flour, but these were very good. Instead of your glaze, I used Splenda Naturals and fresh squeezed lemon juice. Thanks for the recipe! Hi Therese! I am glad you liked them! I’ve made (and love) the blueberry, last night I took another person’s suggestion and also made a cranberry orange batch. I used frozen cranberries chopped into bits in my hand food chopper and a full teaspoon of orange extract in place of vanilla extract. Rather than glaze, I spread about a tablespoon of cream cheese on each piece just before eating…so delicious! Thank you, Wendy! Looks like I’ll need to post a cranberry orange version this fall. Is there any way to make these without almond flour? 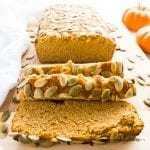 There’s a tree nut allergy in my family and I’d love to make these, but am not sure what to sub the almond flour with. Thanks! Hi Kim, I haven’t tried but they might work with sunflower seed meal (finely ground sunflower seeds). You might taste a little bit of that flavor in them but it should work in the same amount to replace the almond flour. Let me know how it goes if you try! Made these this morning. Very easy and tasty. Love the texture as well as the flavor. I did add cinnamon to the dry ingredients and made a cinnamon glaze instead of the blueberry. Will definitely make these again. Better and easier than paleo pancakes! I am so happy to hear that, Amanda! Thanks for stopping by! I enjoyed this recipe very much. I made a few changes by adding lemon zest to the batter and making a lemon glaze rather than blueberry, but your basic recipe is excellent. I can see easily changing the add-ins to make a delicious variety of scones. My non-keto daughters enjoyed this recipe as well, which is always my measure of a truly great recipe. Please add a “jump to recipe” option on your posts. I understand the reason behind all the ads, but the overwhelming number of them keeps me from coming to your blog more often. I simply want to refer to your recipes not scroll endlessly through ads to get there. Thank you, Stacy. I’m glad you and your daughters liked the scones. I do plan to play with the recipe more to make other variations. I understand your concern about the ads. It’s always a balance as they help support my family and allow me to provide recipes to you for free. But, I also care about you as a reader and your experience. I try to provide value throughout the post, and often offer tips there in addition to the recipe card. I will work with my advertisers to see if reducing ads might be possible. I appreciate your feedback. These were amazing! I am making them for the second time today. (I added walnuts this time with the blueberries!) I also just cooked the glaze all together in a pan and it worked great. We don’t mind the blueberry skins. I freeze them right after making them on a plate then put them into a baggie. They are awesome right out of the freezer. Thank you so much Maya for sharing these with us! I a so happy you liked them, Debbie! Thanks for stopping by! Did you happen to double your recipe and take your photos? Not sure what I did wrong but mine are half the thickness of yours. Sadly. Bummer! Hi Michelle, No, the photos are always the actual recipe as written. The scones will end up close to the same height after baking as they are before, so it’s just a matter of shaping them to the size/shape you want before baking. I hope you still liked the taste, though. Hi! From someone extremely picky, kudos!! These are amazing. They do have a bit of a coconut flavor on the back end so I might also try replacing the coconut flour for more almond flour but if it doesn’t work out I don’t care! I will still make these. Great job; I love these! Hi there, Do these have to be stored in the refrigerator? I made them and I absolutely love them. I’m a huge fan of your site. Now going to be trying more stuff from here this week. Thanks again. Hi Trisha, You can keep them at room temperature for about a day, but the fridge is best for any longer. Hi Sandy, yes, that should work just fine. Hi Sandy, yes, I’m sure that would work just fine. Thank you for the recipe. Easy to make and the scones turned out quite nice. Will definitely make again soon. I bought the best blueberries at my favorite fruit stand and this recipe was perfect! 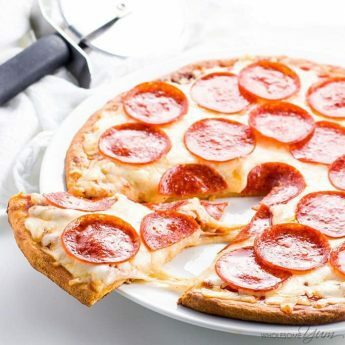 So easy to make and very delicious! This recipe looks amazing but i’m not a huge fan of blueberries. I would love to make this with cranberries and orange (my favorite combination). For the glaze, would you recommend using orange juice or extract and how much? I cant seem to find a good recipe anywhere but this looks perfect, just swapping out the vanilla and blueberries for my cranberries and orange. Hi Jess, Cranberry orange sounds delicious! I’d recommend orange extract for the glaze if you wanted to keep the scones low carb. Start with just a tiny bit, like 1/8 tsp and adjust to taste, since fruit extracts are very concentrated. You could also add some orange extract to the batter itself. I would estimate 1/2 tsp for the whole batch. Let me know how it goes if you try it! These turned out amazing. I ended up doing a 1:1 replacement with the orange extract for vanilla and 1/4 tsp for the glaze. This recipe is so easy and my boyfriend loved the scones as well. He normally complains about scones being too dry and these turned out perfect. Thank you, Jess! I’m glad you both like them! Let me tell ya… these Blueberry Scones are delicious! I made a batch yesterday. I didn’t have erythritol, so I used a little Splenda instead. My family actually liked it. Do you know how much coconut sugar (or maple syrup) I would use in place of Erythritol? Hi Colleen, Yes, you can use the same amount of coconut sugar. Coconut sugar would work better than maple syrup, since it’s granulated just like the erythritol. Hope that helps! What can I use instead of coconut oil and coconut flour? I’m allergic to coconut! Hi Amy, You can easily use butter instead of coconut oil. The coconut flour is more tough to substitute, since it absorbs much more moisture than any other flour. You could try replacing the 1/4 cup coconut flour with an additional 1 cup almond flour (you need a lot more to compensate for the moisture difference), but I haven’t tried it and can’t guarantee the results. Let me know how it goes if you try it! Hi. What can I use instead of the coconut flour? I find the taste of coconut overwhelming. Hi Debbie, Have you tried this particular recipe? It has just a little coconut flour, so you can’t really taste it. But, I’d suggest using butter instead of coconut oil to avoid any slight coconut flavor. If you still want to remove the coconut flour, the recipe would need other modifications since coconut flour is so absorbent. Let me know how it goes if you try something different. The dough was lovely to work with – no need for extra almond milk. I like my scones a bit denser. It was very light and airy. I will make it again with some lemon zest and add raspberries plus blueberries. Thanks for experimenting on our behalf! Thank you, Deb! Yes, you can make them without the almond milk to make them denser. 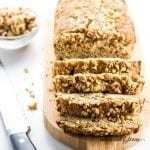 I’m just a month or so into THM and have loved to bake all my life–so find myself trying new recipes that my husband will think taste just as great as I do. I found the link to your page through Pinterest and baked these this morning (using strawberries as that’s what I had). They turned out GREAT! I might try to make an orange one as well, since I have always loved Panera’s orange scones :). Thank you, Maya! Thank you! I need to try these with some variations, too. I love blueberry scones! Wondering though… I do THM, would these be an E or S? Don’t know if you’re familiar with THM. Hi Donna, These would be an S. Thanks for asking! Can another flour be substituted for the almond flour? My sister has nut allergies. Hi Sarah, Sunflower seed flour would probably work, but just a warning – they might turn green in color. Can I use regular milk versus the almond milk? Hi Chrystalyn, Yes, you can! Any kind of milk will work, it would just change the nutrition info a bit. I used 1/2 cup whey protein powder instead of 1/4 cup coconut flour and was really pleased with the results. Very good recipe, a delicious keto friendly treat. Thank you for sharing, Luke! Coconut flour can be hard to substitute for, so it’s good to know that this swap works for this recipe. Can you replace the coconut flour with something else? Hi Melissa, Unfortunately the coconut flour doesn’t have a good replacement in this recipe, since it absorbs so much more moisture than other flours. I have made two batches of these in the past week and they’re amazing! I used almond meal the first time around and they were delicious, but almond flour made them even better. They go right along with “The Fast Metabolism Diet” (phase 3) and feel utterly sinful. Thank you for developing and sharing such a treat! I’m so glad you liked them! Blanched almond flour adds that finer texture for scones. These look incredible, Maya! Pinned & Yummed! These look lovely! We pick 70 pounds of blues every July – I will have to try this! Thanks, Renee! That’s a lot of blueberries. So many great things to be made with them! This is so delicious! Definitely making these tomorrow, hope they turn out as good as yours! Thanks for the wonderful recipe! Thank you, Shreya. Let me know what you think of them! Wow. Love scones. Love blueberries. Definitely making these this week. Thanks Maya. Thank you, Edna! Let me know how you like them! These are low carb? Wow they look incredible!! I love the addition of the glaze! Yes, they only have 4g net carbs and 160 calories each. The glaze really makes them amazing! Thank you so much for your repeat visits and comments.